Summary: Lanore McIlvrae is the kind of woman who will do anything for love. Including imprisoning the man who loves her behind a wall of brick and stone. Last year, I was pleasantly surprised by how much I enjoyed THE TAKER by Alma Katsu -- you can read my review here. I am so not a person who reads books like this; however, everyone was talking about it! So I decided to take the plunge and see what all the fuss was about. I have to say that I agreed that THE TAKER was a fantastic book... and quite the adventure ride. I was extremely impressed with Ms. Katsu's storytelling abilities and I even got up in these characters' lives. 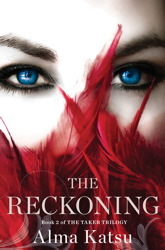 Needless to say, like many of you, I've been anxiously awaiting the second book in the series THE RECKONING for months. And I have to say, my expectations were a bit higher now that I already read and enjoyed THE TAKER. Thankfully, Ms. Katsu delivered with THE RECKONING! It was everything I had hoped for and, of course, I'm now desperate for the next book. THE RECKONING picks up right where THE TAKER left off, and I definitely recommend reading THE TAKER first. I actually can't even speak to whether this book works as a stand-alone because I think it's essential to read them in order to fully appreciate all of the background and character development. It's difficult to describe THE RECKONING without giving away too much about the first novel. In fact, even the publisher's summary gives away some critical plot elements of THE TAKER. So I guess I'm saying that you might not want to keep reading if you haven't completed THE TAKER. THE RECKONING continues telling the story of Lanore, a woman who has been "granted" eternal life by the very cruel Adair. She and Luke are seemingly happy together, and Lanore feels as if it's time for her to atone for her past sins. However, when Lanore senses that Adair has escaped, her life quickly turns upside down and she does everything in her power to save herself. Along the way, she encounters many characters from her and Adair's past, and ultimately, she is forced to face Adair and answer for her betrayal. THE RECKONING had many similar elements to the THE TAKER, and I especially appreciated that there were many flashbacks to the characters' and their past lives. I loved how Ms. Katsu wove so much history into the story as well as how well she set the mood. However, THE RECKONING did have a different feel to me than THE TAKER. I'm not exactly sure why, though. Initially, I thought it was because some of the characters (namely Adair) had changed so much from the first story; and that's definitely one of the reasons. But I also think the book was less dark and less violent, and there just wasn't as much wanton behavior. Having said that, I don't think I missed these lack of these things -- I'm just saying that the book was different. I definitely got caught up in Lanore's story and I even found myself starting to think that maybe Adair had changed for the better (although I'm not entirely sold on him yet.) And while I'm not a fan of most romance stories, I do find that when it's well done, like it was in both THE TAKER AND THE RECKONING, I appreciate even that aspect of the story line. I do have to warn you though, THE RECKONING ends with a major cliffhanger about Adair and his past. So if you read this book, I can pretty much guarantee that you will have to read the next one! THE RECKONING would make a very interesting book club pick. Maybe your group could read both THE TAKER AND THE RECKONING together so you'd be able to discuss the character development through both books. There is a reading guide available which has fourteen discussion questions as well as some suggestions to enhance your book club. Ms. Katsu even makes herself available for author chats. Some of the themes that you might want to explore include love, passion, loyalty, secrets, sacrifices, change, and forgiveness. I thoroughly enjoyed THE RECKONING and I have to admit that I'm really excited to learn more about Adair's life in book three. Highly recommended for fans of historical and paranormal fiction. Thanks to the publisher and Wunderkind PR for providing a review copy of this novel. I haven't read this yet ... so glad to know that your expectations were met, and then some. Alma is such a great person. I'm glad to know her books are so good! And thanks ladies, for the comments and support! Love the book blogging community! I have never heard of this one but I am so adding it to the TBR. Both books look amazing!! I'm pretty close to finishing this one, and I totally love it. And yes, I love Alma but it has no bearing on the fact that both of these books have sucked me in. You are right, this one does have a different feel. When I finished The Taker, I had nightmares! But this one...Adair is changing and you can only appreciate that if you know how totally horrible he was. We get filled in on back stories, and there is definitely more of a love story going on here. People called The Taker a love story and I snorted, but this one has got it for real. LOVED this book. I am so glad that you read and enjoyed these books even if they are outside your normal reading.